Produced by: BJP and other opposition parties. Action & Stunt coordinators: VHP, RSS, right-wing groups and some …. Story line: Fighting for a bill that will eradicate corruption and change the fate of Indians. 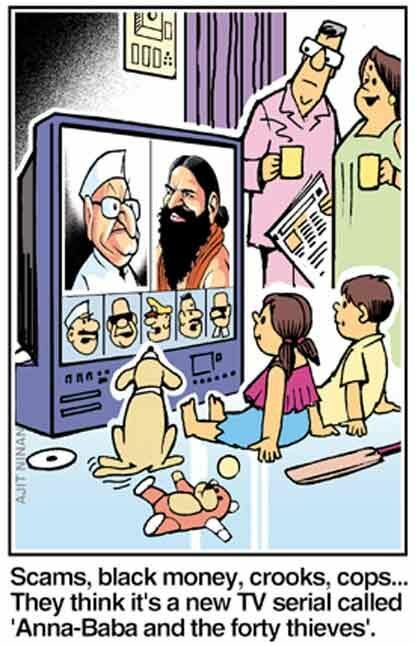 Highlights: Poor Anna been sent to Tihar jail (very emotional scene), Rakhi Sawant-Baba Ramdev-Rahul’s Item song in Tihar, UPA’s comedy of errors, Punch dialogues in parliament. Budget: Several sessions in Parliament, Increased flights & trains, Intense policing, public disorder maintenance, holidays to government offices & schools, and cant fit all here. Only white money will be used. Awards and Nominations: Will be nominated for ‘Bharat Ratna’, if BJP comes to the power. Some say ‘new age Gandhi’ and others ‘media-fed megalomaniac’? My Review: A great story on dependent personality disorder. The classic hope of ‘one thing’ presumed to change everything. Last but not the least, ‘Mirror Mirror Who’s the Fairest of All’?